Archelon differed significantly from modern turtles in two ways. First, its shell wasn't hard, but leathery in texture, and supported by an elaborate skeletal framework underneath; and second, this turtle possessed unusually wide, flipper-like arms and legs, with which it propelled itself through the shallow Western Interior Sea that covered much of North America about 75 million years ago. Like modern turtles, Archelon had a human-like life span as well as a nasty bite, which would have come in handy when tussling with the giant squids that constituted the bulk of its diet. One specimen on display in Vienna is thought to have lived for over 100 years, and probably would have survived much longer if it hadn't asphyxiated on the sea floor. Why did Archelon grow to such an enormous size? 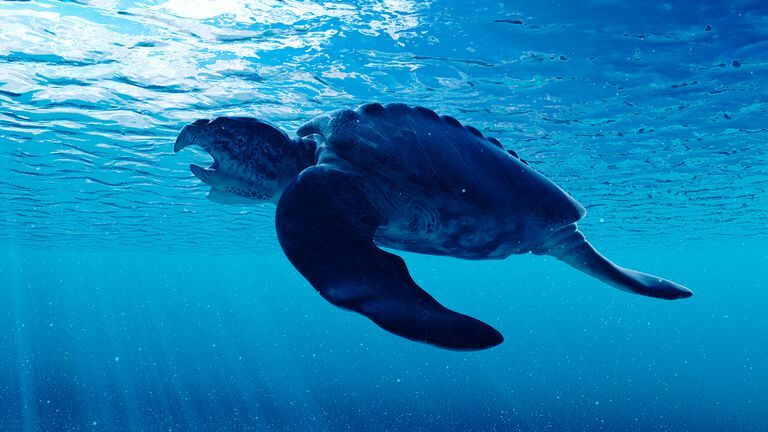 Well, at the time this prehistoric turtle lived, the Western Interior Sea was well-stocked with the vicious marine reptiles known as mosasaurs (a good example being the contemporary Tylosaurus), some of which measured over 20 feet long and weighed four or five tons. Clearly, a speedy, two-ton marine turtle would have been a less appetizing prospect to hungry predators than smaller, more pliable fish and squids, though it's not inconceivable that Archelon occasionally found itself on the wrong side of the food chain (if not by a hungry mosasaur, then perhaps by a plus-sized prehistoric shark like Cretoxyrhina).